Anava had never interacted with another entity or another person in dreamtime, besides the spoken guidance of Rana or her teachers. Until now, she had not interacted with another consciousness here. Or at least an interaction that included eye contact. Stay confidant. Stay strong. Stay here. Her heart pounded as it never had before, her dreamtime world playing and unfurling in front of her very eyes. The strings of life. Songs of reality. He looked as surprised as she was. His face wet, and anguished. As she suspected, it appeared he had been mourning here. “H – How did you find me out here?” his throat crackled, and it was clear to her that the scream she had heard was his. Before she could fathom an answer to his question, Anava suddenly felt herself talking. It was as if another power was speaking for her. Through her. The feeling was so foreign, and she didn’t recognize her voice. Anava felt a recognition, but couldn’t place his face. He was somber, and his features handsome. Dark hair cut short, rather than grown out and braided as she was used to seeing among initiates. “Oh.” He answered back, as he cleared his throat again and averted his eyes. He was clearly grappling with something that was weighing him down. He ran his hands along his temples and damp cheeks as he sat up against the tree. Again, she heard herself speaking – as if from thin air and of no volition of her own. His name is ‘Z’ – I don’t know anyone by that name? Anava observed him, trying to note everything about him. Her eyes obeyed, but her body still resisted movement, as she remained kneeling. She was a visitor in this experience. Maybe I do know him? This man – “Z” – suddenly guffawed, stretched his neck, and tensed to her question. “I’m fine,” he mumbled. “I’m – It’s just – I’m not – You didn’t have to. Really, I’m just –” He rubbed his eyes, and his words trailed off. Anava stayed still, and waited for herself to answer him. She was not in control. Sure enough, she felt herself lean towards him – her heart racing in time with this submersion of reality, a submission to something immensely greater than herself. She felt a singing of potential in witnessing it act from within her. She heard herself speak. Then she felt herself place a hand on his heart. Her eyes widened with puzzlement at the meaning of those words and what was to come. And just as easily as the dreamtime scene had invited her in and had enfolded her in a place so vividly and viscerally hers, the moment disintegrated and faded out of existence without any trace, leaving her in darkness. Her eyes shot open in a heaving breath. Her brow caked in sweat, her heart cracked open and silent. The same rawness and exhilaration pulsed through her veins as her first dreamtime walk, but now it had amplified tenfold. Anava was shaking and shuddering and orienting herself to the time; dusk had just landed, and the cool night air had arrived for her just in time. It seemed that she had been in dreamtime for a few hours. She wiped her forehead with the ends of her sleeves. She was still in the pavilion of stones, but no one else was around. The older gentleman had gone, and the bells and chimes in the trees around her jangled gently with the night breeze. After another deep breath, the enormity of her dreamtime walk sunk in. Her questions, her pleading, her desire to heal and sort things out with Rana and Ren. And then him. Anava sat in silence for a long while, not sure how to process her venture into dreamtime by herself. It was silly to seek these questions without a guide. How would she explain this to anyone? No one had witnessed anything but herself. There would be no way to sort fact from fiction – and no way she would remember all that had happened. Ephemeral dreamtime was, in a sense, very real, but once exited, the details from your time there tended to blur and coincide and recede and combine with current realities. It would intertwine with waking life, and the true root of the experience would be lost. Memories of dreamtime did not seem to stick very well to physical reality. Anava took out some pages from her books and furiously started to write everything she could remember in as much detail as she could manage with a thin, penciled piece of charcoal. She would have to re-imprint on this later. Her pulse was still racing, and sweat dripped from her chin. It dropped on the pages and smeared the furious scribbling. Her hand could not move fast enough to keep up with her thoughts. She wrote of her questions, and the note of the scream. She jotted down the name of the man in anguish under the tree – his look, hair, clothes, his jagged pearly aura that gave her pause. She noted their conversation and how she had heard her own voice talking through her, acting the scene out – and how it seemed like he recognized her immediately. His intensity had softened when she had spoken, as if she had a comforting presence to him. Why did the Graces bring me to you? How do you relate to my questions about Ren and Rana? Then the clarion bell sounded from beyond the hill: ceremonies at the temple were in session. Anava slammed shut the thin pages of her book and threw it in her bag. She sprinted down the hill, almost sliding on the dusky, slippery grasses. She was late, unimaginably confused, and incongruently happier than she had ever felt. Rana was not at ceremonies that evening, and leader Soan did not seem to acknowledge Anava entering late and sitting down at the back of the room, as quiet as she could be. A few other initiates shot her disdainful glances, but she did not notice them. She looked around for Ren. He was not present. Her thoughts accelerated, and the worry started to creak. Frowning, she took out her notes and her own copy of the sacred text for the ceremony lesson, but it was impossible to concentrate. Pages of black, smeared scribbling fell open onto her lap and the lessons going on around her faded into distraction. If Anava continued her lessons with Rana, she would have to tell her about her dreamtime adventure, and subsequently, her desire of healing. Of the man and the grief that she encountered after asking a question of the Graces. A question that directly involved herself and Ren. Lately, my writing is getting me fired up. Like a worked up, lathered feeling – almost sexual?! – but in a mental / intellectual way. A spiritual way. Does that even make sense? I have been doing a lot of world-building in my head for my theoretical novel. An idea that I had in 2009 and hasn’t died – only intensified. I’m inspired and obsessed with writers that can create intense, detailed “other worlds” in their work, and I immerse myself deeply into them. I eat and breathe them. It should be no surprise, then, that I am a huge Game of Thrones fan. I follow fan theories and detailed analyses on the text closely. I want to re-read all the books in the series, and seeing the tall stack of them by my nightstand gets me excited. A piece of me knows this is what I want to do. Story-crafting, world-building. Reimagining our current world and future worlds. Imagination of the mind… Imagination of the heart. Earlier this year I listened to a keynote speech given by the head of innovation for Lowes. (Yes, the home improvement big box store – you are as surprised as I am.) He tackled the subject of how exactly do you innovate – how do you see what’s coming? How do you see into the future? Rather than try and keep up with the pace of culture and trends, and try fruitlessly to get ahead of them, he was creating the future. Literally. They didn’t want to race the trends, they wanted to create the trends, and here’s how: He hired a team of sci-fi writers and gave them all of Lowe’s marketing materials and told them to go write stories about how the company might look as a part of the future. This is called Science-fiction prototyping. The sci-fi writers wrote, and in the end their stories were translated into graphic novels and distributed to the company. The result? Lowes began developing two initiatives that no one is or was developing. One is a “holoroom” where homeowners can visualize their home improvement projects before they are finished, the other a customer service robot that greets you at the door and knows its way around the store. You can watch a short Youtube clip to see what I’m talking about HERE. This really hit me. It really drove home to me, suddenly and deeply, how important it is to be a writer. Writers – and especially science-fiction writers – are actively creating our collective futures. They influence us, propel us forward, and incept more ideas than any other source. Just think about the fact that something like a ‘holodeck’ is really being created, and NASA is working on a warp drive! Where did those ideas originally come from? Star Trek. I imagine that perhaps in olden days, in ancient times, the writers were the oracles. Rather than write lengthy stories they would imagine the future and pull “prophecies” from the ether, influencing the collective consciousness. Creative gurus. The masters of our destinies. After hearing this talk about the sci-fi prototyping, I knew in that one sliver of an instant that I needed to write. That I was meant to write. To influence things and propel them forward. To use imagination integrally in my life. 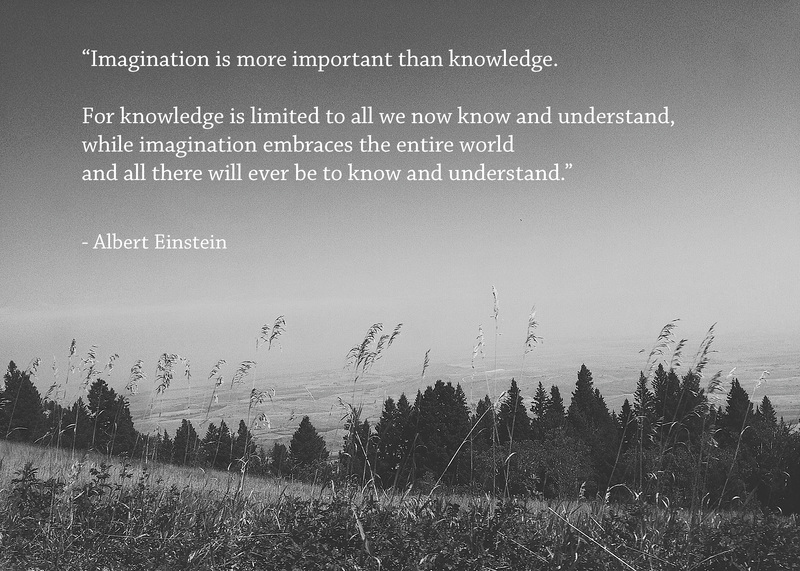 To use imagination to gain access to potential knowledge of the future. What a heady, weird day that was. I was amazed, flabbergasted and passionate. I couldn’t understand why some of my other co-workers were not as floored as I was – they had listened to the same talk, but I was the only one who felt the ‘THUD’ of a mind-melting realization. I had been looking so hard, and been so dejected, for many months about what in the world I was passionate about. A book I had been reading asked me the question, and I didn’t know how to answer. Then this keynote talk just dropped in my lap. Slapped me in the face. Punched me in the gut. You get what you ask for. You really do. But you have to ask. My next entry will cover imagination and how I feel it works spiritually. I have found that it is integrally related to my concept of God, and potentially others’ as well.